My take: The McCarthy sisters are about to face big changes in their lives. Clare caught her husband of sixteen years cheating (again) and it’s the last straw. Maggie’s daughters are presenting the usual challenges that come with young teens. She’s also wondering why her husband doesn’t seem to find her attractive anymore. That has to be why their love life is lacking, right? In the years following their mother’s death, youngest McCarthy sister Sarah has become an almost reclusive artist spending every waking moment at her studio. When will she find the courage to jump back into life? When Clare flees the scene of her husband’s latest incident she’s involved in a terrible accident. Her recovery will take months and she’ll rely on her family like never before. There are a couple of male friends who will try to be part of her healing. Maggie can only hope there’s time to get her oldest daughter back on track. Sarah completes a self-makeover with interesting results. It’s not just Clare who’ll need the support of her sisters. All three will prove their love for each other through strength that only sisters can show. 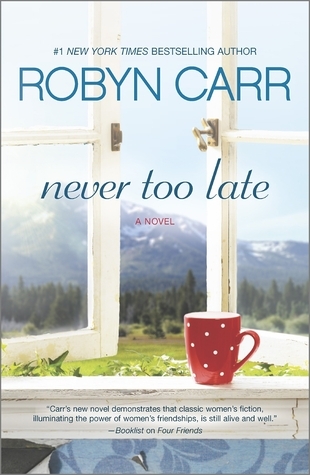 I enjoyed Robyn Carr’s updated rerelease of Never Too Late. I didn’t have a chance to read it the first time around. There are moments with the mothers and their children that most mothers will relate to and I know many readers with sisters will find much that resonates. I’d recommend this book to fans of the author and contemporary women’s fiction.